In 1994, Republicans rode a wave, taking complete control of Congress for the first time since 1955, using the Contract with America to appeal to voters who were frustrated with the policies proposed and advanced President Bill Clinton. This document was an extraordinary statement of limited government. Through this plan, Republicans -- led by House Minority Whip Newt Gingrich (R-GA), who would go on to serve as Speaker from 1995 to 1999 -- to eliminate entire departments, cut wasteful programs, and much more. Though Republicans did hold votes on many of the planks of the Contract, the commitment to the limited government principles in the document didn't last long. In his book, Buck Wild: How Republicans Broke the Bank and Became the Party of Big Government, Stephen Slivinski detailed the history of the betrayal of the principles of 1994's Republican Revolution and how GOP leadership in Congress, who often railed against its fiscally conservative members, laid the groundwork for a big spending Republican president, George W. Bush. By 2000, as Ed Crane, then-president of the Cato Institute wrote at Forbes, "the combined budgets of the 95 major programs that the Contract with America promised to eliminate have increased by 13%." Republicans, he said, had become "feckless defenders of limited government." Republican lawmakers all too willingly went along with President Bush's spending increases, ostensibly giving him whatever he wanted. While some may say that this spending binge was driven by defense spending, President Bush's brand of "compassionate conservatism" came with large increases in non-defense discretionary spending as well as a new entitlement program, Medicare Part D.
Republicans -- mired in scandal, an unpopular war, and deficits driven by big spending -- were wiped out by Democrats in the 2006 congressional elections. It appears, though, that Republicans leaders, especially Speaker Boehner, have learned nothing from their time in the political wilderness. Much like Republicans leaders who preceded him -- including Gingrich, who is openly backing the Ohio Republicans for another term as Speaker -- Boehner has proven to be someone who isn't willing to fight for the limited government principles on which GOP candidates run and goes out of his way to antagonize and deride fiscal conservatives. Some say that the fight over the Speaker's gavel is one not worth having, that the grassroots' efforts would be better spent pushing back against President Barack Obama and Democrats. But here's the question which no one seems willing to answer: If we don't begin to Republicans accountable now, when is it appropriate to do so? If we don't stand up for fiscally conservative, limited government principles and hold leaders accountable now, it'll be more difficult to do when there is a Republican in the White House as well as a GOP-controlled Congress. 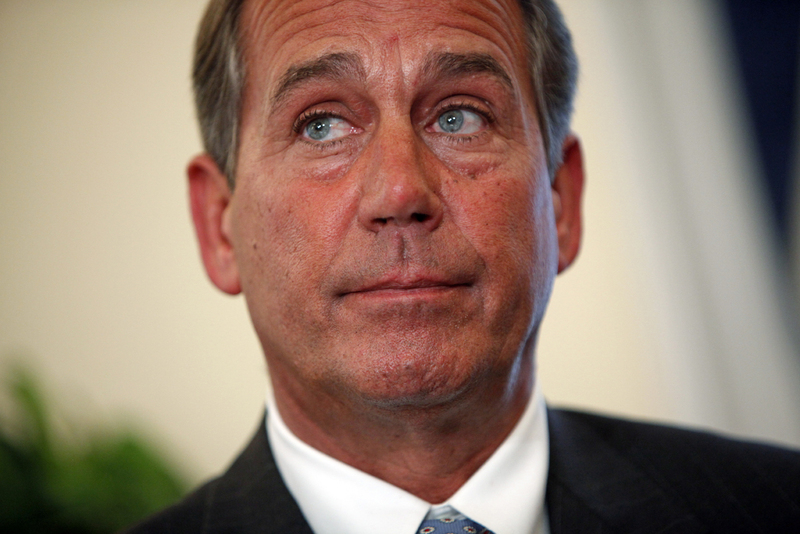 Boehner doesn't even know what limited government is - he's part of the problem. No different from Pelosi or Obama. I am done with the GOP!! They have no principles!! FreedomWorks today voiced strong opposition to a change to the rules of the House of Representatives proposed by Rep. Devin Nunes (R-Calif.). The proposed rule change would dissolve the privileged status of the “motion to vacate the chair,” by which an individual member could make the motion from the floor and force a vote to vacate the office of the Speaker of the House, and require a majority of a party’s conference to introduce the motion. With Paul Ryan still sitting squarely on the fence about whether or not he will run for Speaker of the House, the Republican leadership elections still remain largely up in the air. There has so far been a troubling inability of the conference to identify a suitable candidate who embodies the values that are important to an open congressional process, and who could garner enough support to actually win the election. The House Freedom Caucus scored a major victory on Wednesday when House Republican leaders announced that they will seek potential rule changes to open up the legislative process. The lack of an open process has been among the central grievances of the group of about 40 fiscally conservative and liberty-minded members.